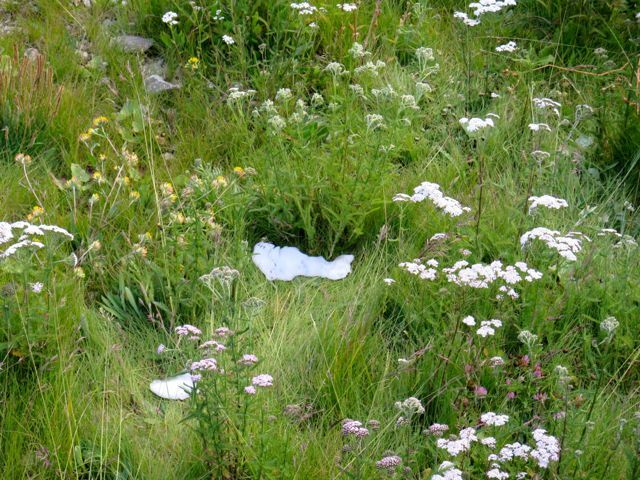 When in 1864 Hotelier Johannes Badrutt of St. Moritz, Switzerland promised his English summer guests heaven on earth, he could not have known what the future held for the Engadin Valley. He made a bet that even in winter they would be able to enjoy mild sunshine on his terrace in shirtsleeves; if not he would reimburse their travel costs – both ways! The guests took up the challenge, coming back that Christmas only to return home at Easter tanned, relaxed and very happy. And so winter tourism in the Alps was born. Since then, the British have flocked to the region each summer leaving their mark in the form of polo, cricket and an appreciation for the harmony between rustic tradition and upper-class service that can still be felt here today. Matched by an average of 322 days of sun a year here, providing that dry champagne climate that the town has become known for. Magic Hour highlighting the surrounding Swiss Alps. I visited in early September 2014 and there was already a fresh sprinkling of powdery snow on the mountain tops, the sun was out and the setting picture perfect. Located at 1856 metres above sea level in the Upper Engadin lake region, this cosmopolitan town aptly described as chic, elegant and exclusive, was built on the site of therapeutic hot springs enjoyed from the start of history. It’s here at Switzerland’s highest lying mineral spa that a healing energy bubbles up to benefit residents as well as visitors to the region. Three different cultural regions converge in St. Moritz. The Romansch language of the Swiss, Italian and German. Each bring the best of their worlds. 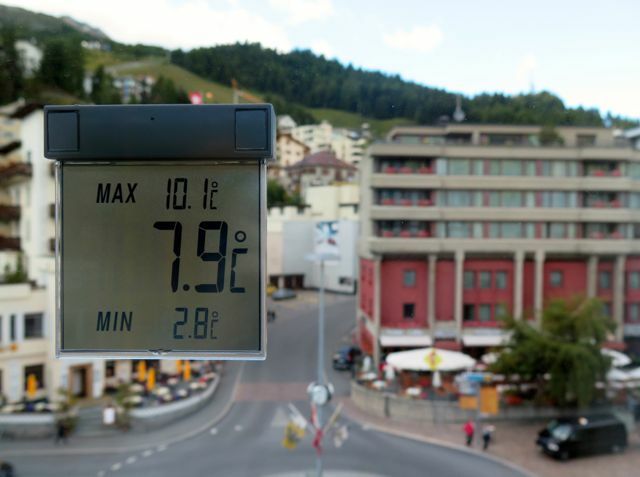 As for the numbers, in 1830 St. Moritz counted only 200 inhabitants which has increased to about 5400 today. During high season I’m told that 21 000 guests and employees join the ranks, leaving the town bursting with the knowledge that adventure based happiness is within easy reach. I spent the afternoon with our guide Mario; charming, friendly, Italian and St. Moritz born. He took us on a walking tour, my favourite way to meet a place, walking down to Lake St. Moritz to take in the views. It was easy to see why famous people like Alfred Hitchcock, Brigitte Bardot, Gunter Sachs and Charlie Chaplin had been drawn here over the years. Also why St. Moritz has had to protect its name as a trade mark original – the first resort to do so – in 50 countries around the world. It’s a place we’ve come to know from James Bond movies, Peter Starstedt songs and the Winter Olympics. Oh, and probably the best big brand shopping imaginable! Whether its designer clothing, a Maserati or fine Swiss Chocolate, you’re in the right place. All the prestigious names on the international fashion scene are lined up next to each other. Be it Winter or Summer, you will find every sport on offer in this outdoor paradise. 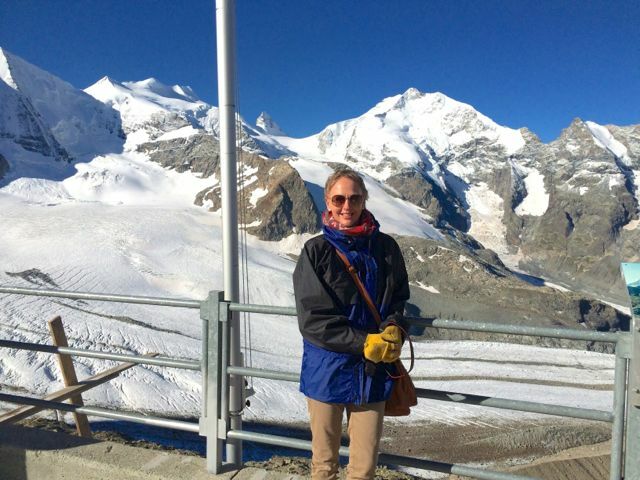 From hiking, mountain biking, sailing, skiing, snowboarding, cresta run tobogganing to the annual White Turf horse race on the frozen Lake St. Moritz. Actually they told me at the Hotel that the only thing they couldn’t organise for me was deep sea fishing … Great humour. This year St. Moritz celebrates 150 years of winter tourism, its pioneering role and long-standing tradition as the world’s oldest winter holiday resort, with all kinds of festivities. It is their busiest time with people from all around the world toasting the season and taking to the perfect pistes and safe snow conditions. The whole place is under snow! Over Winter and Christmas time, St. Moritz and the village is most alive with the famous shopping street Via Serlas filled with romantic horse-drawn carriages. Christmas Markets are enjoyed; La Punt, S-chanf, Zernez, Pontresina at Hotel Walther and the St. Moritz. The Christmas trees of Badrutt’s Palace Hotel lights are turned on with the whole street lit up too. An event for everyone with complimentary Glühwein and cookies served to all in attendance. Looking glass over Lake St. Moritz. Lake St. Moritz looking towards the source of the hot springs. Badrutt’s Palace Hotel, St. Moritz. Mario, the Italian Guide that showed me around St. Moritz. Hotel Schweizerhof was home for the moment. 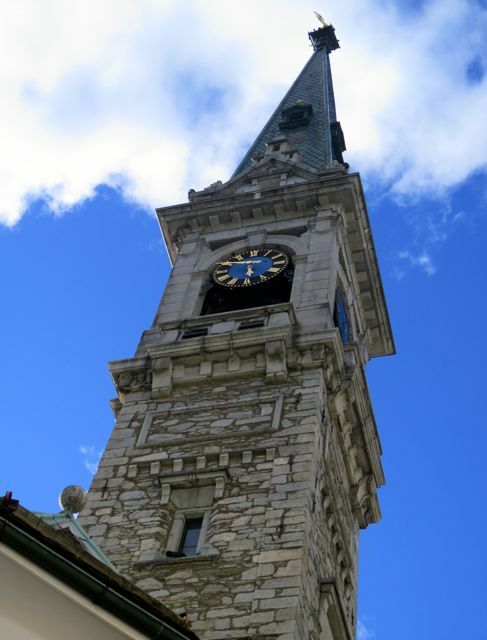 St. Moritz Church in the centre of town. Just outside St. Moritz is Diavolezza, a place of Eternal Ice and She-Devil legends. At about 3000 metres above sea level, the Beautiful She Devil is one of the most popular skiing destinations in the area. 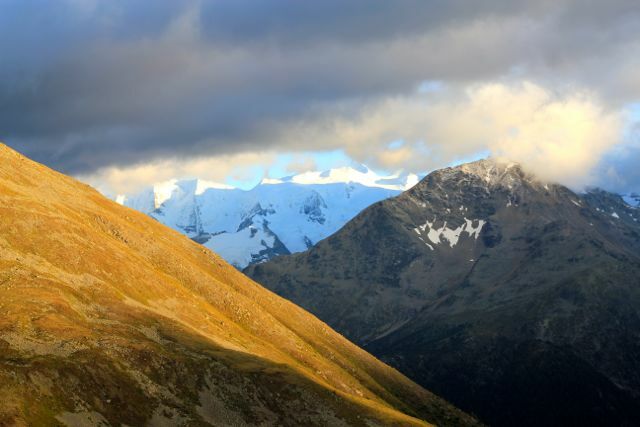 With its eight peaks, ice-capped ridges and perfect mountain scenery set to cast a spell over all who visit. 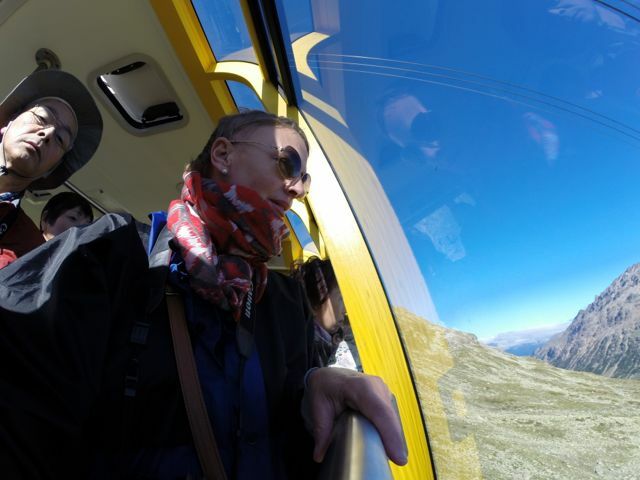 We took a bright yellow gondola to the top where the impressive views drew our attention to the Pers and Morteratsch Glaciers, as well as Piz Bernina which peaks at 4049m, the highest mountain in the Eastern Alps! One of the most impressive glacial sites I’ve encountered and if it comes with the risk of a mesmerising She-Devil, I am all for the risk. 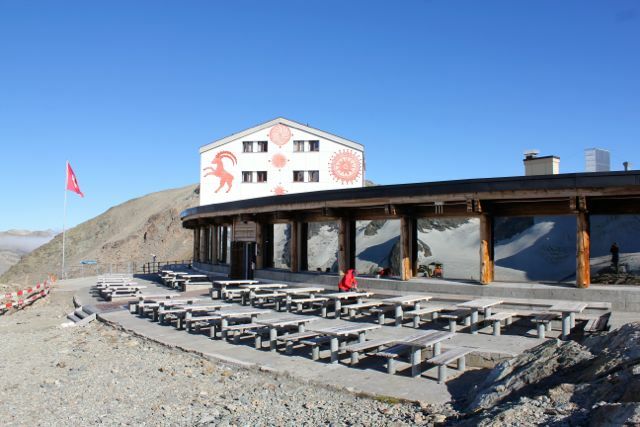 The top station has a good restaurant, outdoor deck which captures the best view and the highest jacuzzi in Europe with Berghaus Diavolezza, offering a selection of rooms should you wish to overnight here. At Diavolezza relaxing into the beauty of the place. The restaurant and gift store, where a hot chocolate in the warmth of the sun is a must. 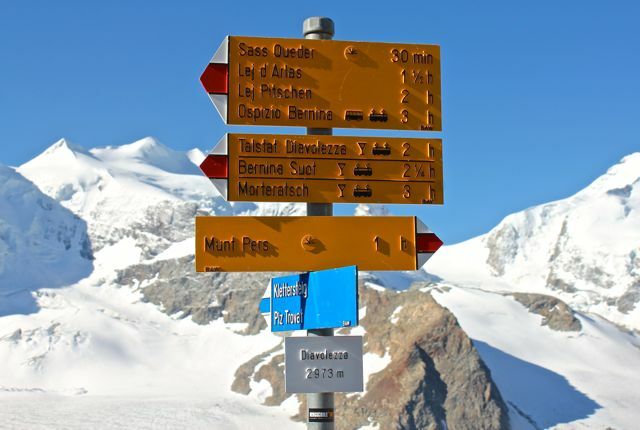 Highlighting the various hikes and ski run options from the top into the mountain. With Munt Pers the main one. Many were opting to walk up with their hiking poles, something that is only possible in the Summer months. 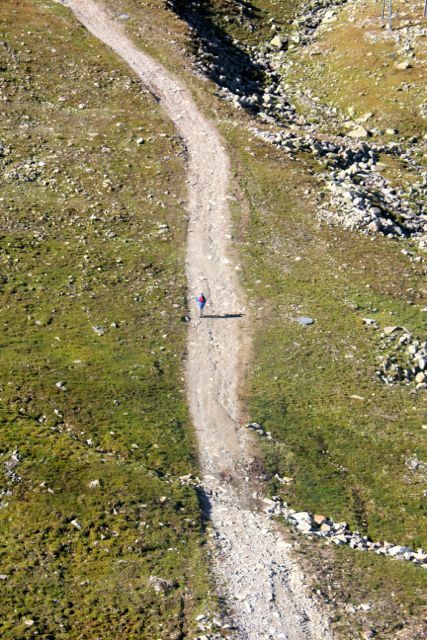 Come winter, this is a popular ski run. 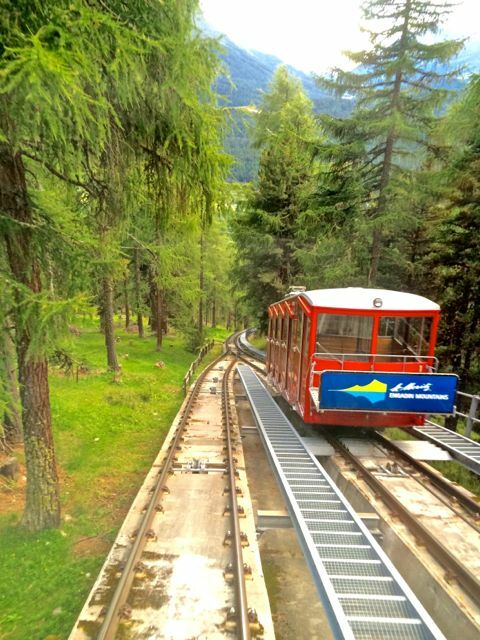 On one night, we rode the funicular up to the The Romantik Hotel Muottas Muragl just outside St. Moritz for dinner in their Mountain Dining Restaurant. 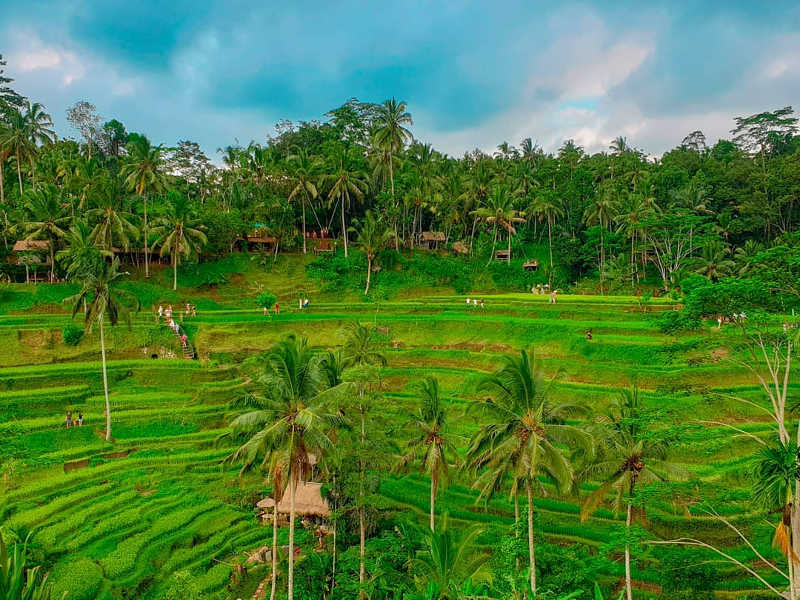 The climb from Punt Muragl Valley takes ten minutes ushering you through 2201 metres of steep mountainside and sweet smelling pine trees to this spot that has known a century of hospitality. At a height of 2456m above sea level the temperatures drop with the climb, and on the night settled at -2°C on the hotel’s wooden deck, with sprinklings of snow underfoot. The Romantik Hotel is also the first plus-energy hotel in the Alps. Funicular up to Hotel Romantika Muottas-Muragl. 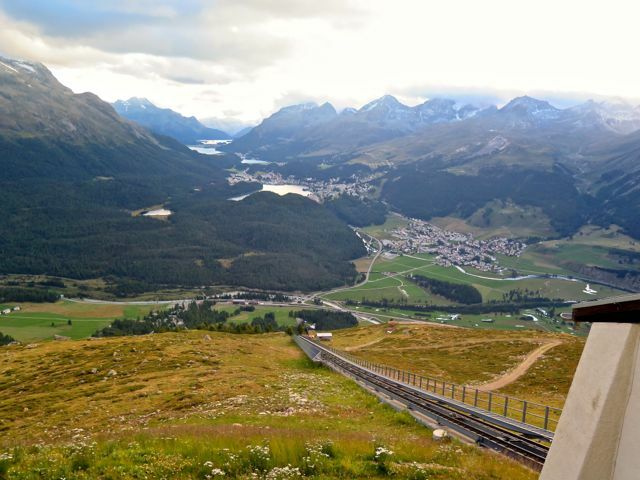 The view towards St. Moritz from the top of the world. Snow on the ground, in September. A favourite thing about this pristine country. 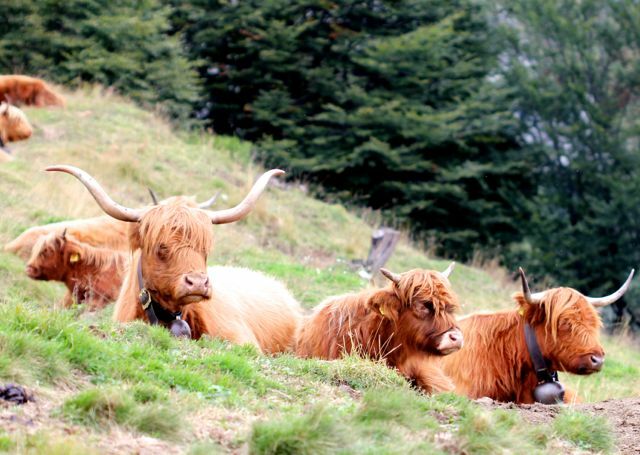 The fluffy caramel coloured cowbell clad cows that speckle the landscape. The clouds are different here. The waters a metallic teal that shimmers in the light. The air fresh. The snow a perfect shade of pure. The Swiss adage build high for overview and maximum sunshine guarantees you the best vantage points to enjoy that perfect time at the end of a day, when dusk falls. Sheer panoramic indulgence with the song of cow bells reaching you on the chilly wind … A healthy, adventure based, beautiful place to visit. 150 years of happy holiday makers can’t be wrong. Afterall, in 1864 a Swiss bet a Brit that he’d discover Magic … He won the bet. Book a guide if you can, well worth it to learn more about the various buildings and the significance they hold in the town’s history. In the Design Centre take the escalators down to the terrace overlooking the lake, I took them down but walked back up. 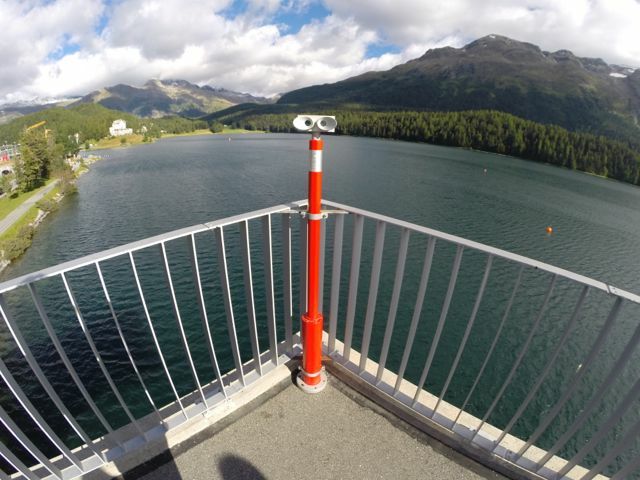 A must do is to stroll around Lake St. Moritz to take in the various look out points. Visit the original Heidi Hut on the mountain just outside town. Because Heidi matters. Take the funicular up to The Romantik Hotel Muottas Muragl which at 2400m above sea level boasts the most beautiful vantage point in the area. Endless beauty, and sublime locally sourced food at their Mountain Dining Restaurant and ambiance for days. Go in the Spring time when you can have the place pretty much to yourself. Go in the Winter time to find out what the celebrations are all about. 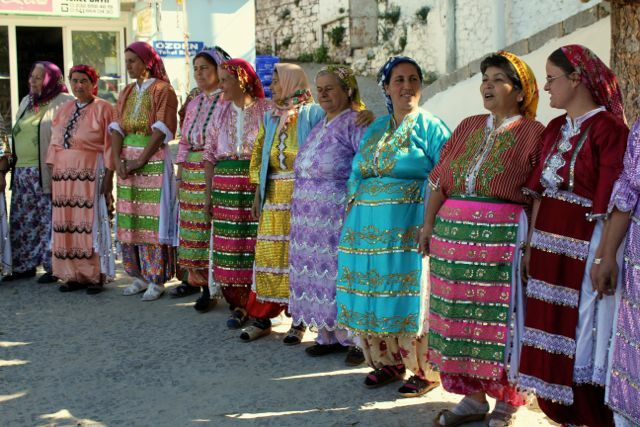 Try the local nut cake or Bündner Nusstorte – often! Download the St. Moritz App that will help with your planning. 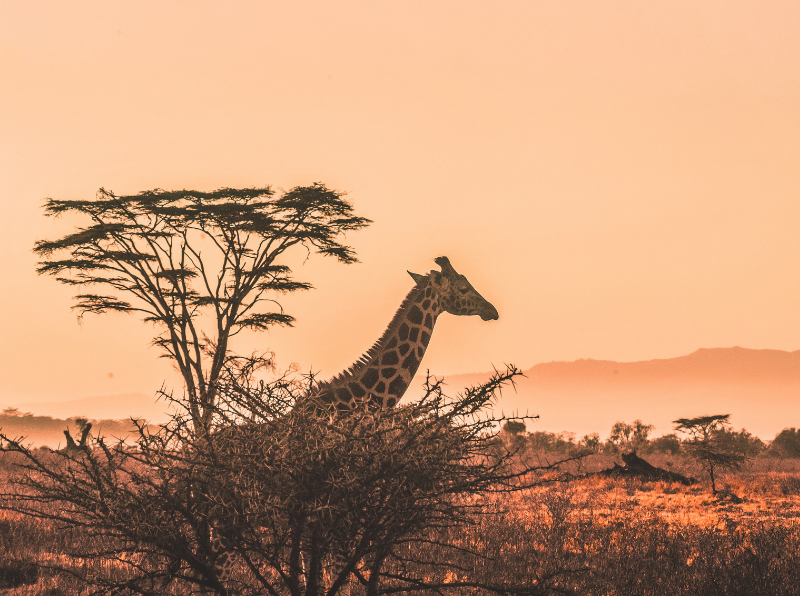 Swiss Airlines offers daily direct flights from Johannesburg to Zurich and during November to April, their partner Edelweiss Air offers twice weekly flights directly between Cape Town and Zurich. Both provide excellent value. Once you’re in Switzerland, buy a SWISS Pass suited to the number of days that you will be there. 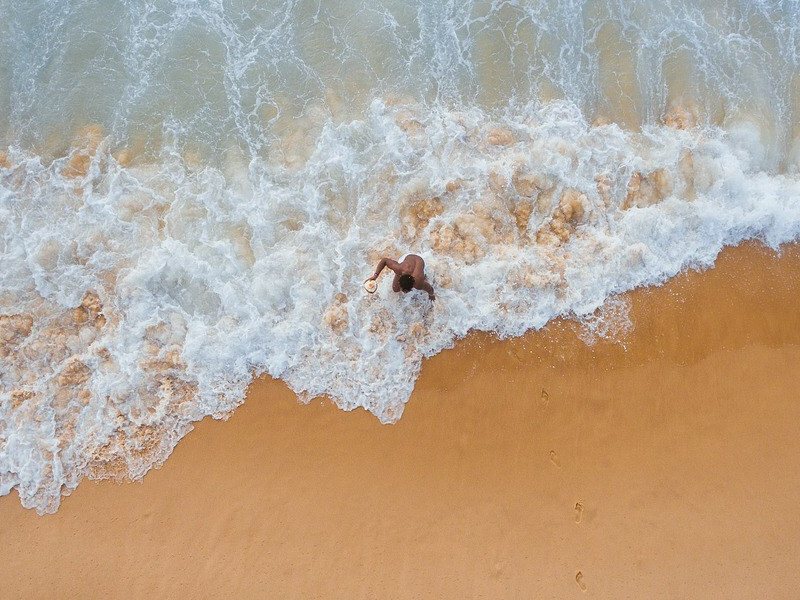 There are flexible options available that include the panoramic routes, public transport in 75+ cities and towns, entrance to over 480 museums and additional discounts. 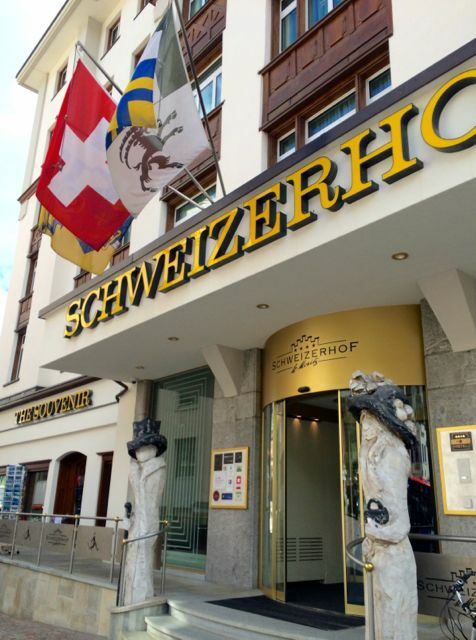 Best value travel that makes exploring Switzerland very easy and convenient. 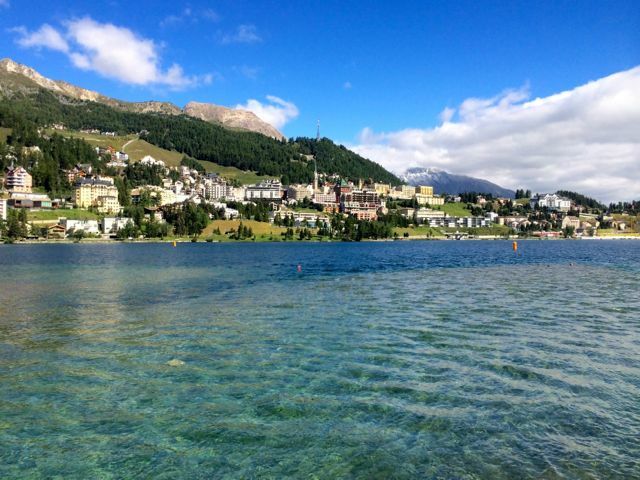 Guests staying in St. Moritz, Switzerland for more than one night can purchase a Hotel Ski Pass for best value skiing. The St. Moritz 150 year anniversary programme will run through the entire 2014-2015 winter season, from 5 December 2014 to late April 2015. For more info look at the official My Switzerland website. 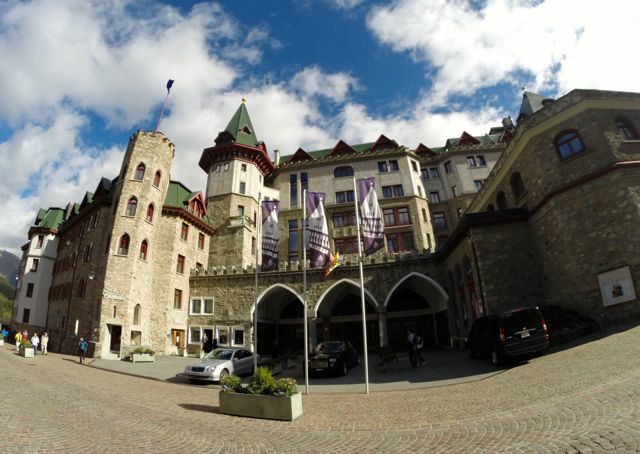 For my visit I was hosted by Swiss Airlines and Switzerland Tourism on their media trip, travelling with the Swiss Travel System to Engadin St. Moritz, where I stayed at the iconic Schweizenhof Hotel. For more info contact Stephanie Elmer of Tourismusorganisation Engadin St. Moritz at stephanie.elmer@estm.ch | www.engadin.stmoritz and follow them on Facebook. She’s as gorgeous as the valley she so effectively promotes! Engadin St. Moritz put together this video to take us through their history and formation as a winter destination.